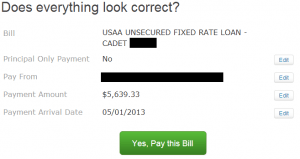 USAA Career Starter Loan Paid Off 2 Years Early! We have reached another milestone in our journey to financial independence. After 2 years, 5 months, and 26 days of repayments, I made the final payment on my USAA Career Starter Loan! When I started repaying the loan, it had grown to over $26,000. With payments of $471 over the next 5 years, I was looking at nearly $2300 worth of interest. Just six months ago the loan was still around $10,000. At the time, I predicted we'd have the loan paid off by Dec 1, 2013. We beat that goal by over half a year and saved over $1000 in interest payments. How did we pay if off 6 months earlier than our already ambitious goal? By saving money on deployment, never paying for cable TV, increasing our income with AirBnB, and decreasing our monthly expenses by over 25%, we were able to make the final push and pay off the loan over half a year early. We were already paying almost 75% more per month than the minimum. Every month, on top of the $471 minimum payment, we'd make an additional $304 payment. This debt avalanche saved us about $1000 in interest and cut 2 whole years off of the life of the loan. With the final epic $5000 payoff, we were able to slay the evil beat once and for all! The most exciting thing about paying off this loan is it freed up $775 of cash flow every month. Because I'm about to hit a time in grade promotion mark this month and we're about to finish paying off our PCS advance in July, we'll see our income rise while our expenses are falling! This is the perfect time to begin maxing out our Roth TSP and Roth IRA. While I still have $29,000 in student loans from Sallie Mae, the interest rate on these loans is ridiculously low (1.75% and 2.75%). As long as the rates stay below 3%, we're not going to prioritize paying off these loans. By paying off the USAA loan, our minimum monthly payment for student loans dropped from $696 to $225. This means we can live safely with a smaller emergency fund and start prioritizing our investments. We're very excited to see the student loan payoff chart take a big dip this month. We're even more excited to have the opportunity to begin contributing to our gap fund and retirement accounts in a meaningful way now, rather than later. ← Should I Get the AAFES Military Star Card or Rewards MasterCard?